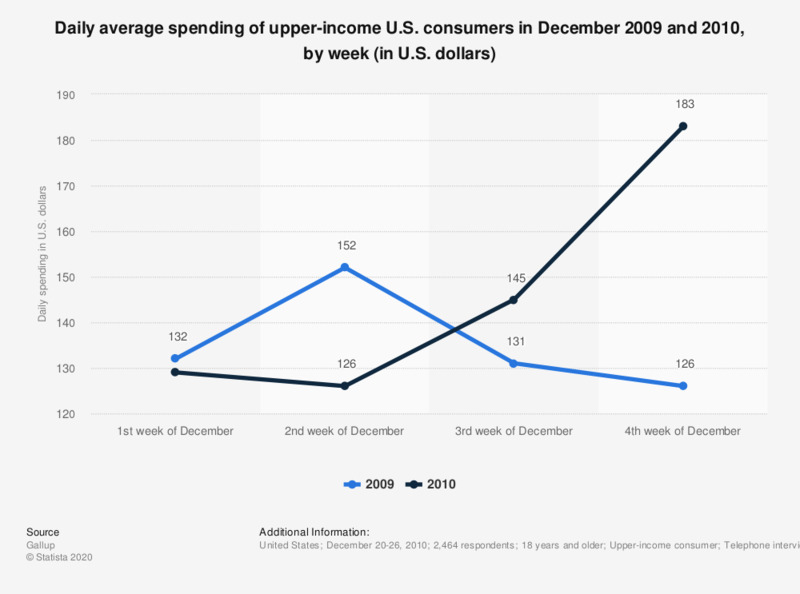 The statistic depicts the results of a survey about upper-income U.S. consumer spending in December 2009 and 2010, by week. Contrary to 2009, when the spending declined week by week as Christmas approached, U.S. consumers with a high income, or "upper-income consumers", as the source calls them, spent more in 2010 the closer they got to Christmas. The respondents reported to have spent an average of 183 U.S. dollars per day in the 4th week of December in 2010. Whether this is because their Christmas present shopping sprees were planned better in 2009, they did not say. According to the source, "[u]pper-income Americans are the consumers who have the disposable income to spend if they so chose and they have been holding back given the uncertainties surrounding the future course of the economy and, possibly, government tax policies. By increasing tax certainty for the next two years, the new legislation might have encouraged these better-off consumers to feel more comfortable spending more freely during Christmas week. The "wealth effects" associated with increasing stock values on Wall Street may have also encouraged upper-income spending late this year." 2010 data based in weeks ending Dec 5, Dec 12, Dec 19, and Dec 26. 2009 data based in weeks ending Dec 6, Dec 13, Dec 20, and Dec 20-22.